Adding a designer touch to a decor and enhancing a room's appearance is easy with a designer rug from Michelle Collins. Designed and handmade exclusively for Think Rugs in four stunning designs and two popular sizes, 120x170cm and 150x230cm. 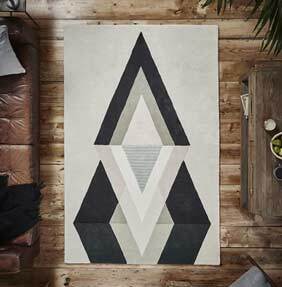 This striking rug collection is designed by the Sheffield based designer and painter. Michelle's rug collection is inspired by travel and buildings she has visited around the globe. Unusual building shapes and negative space that they create and her love for geometric design and minimalist interiors was all the inspiration she needed. This inspiration can be seen in each design by the minimalist backgrounds and colour combined with bold and striking shapes.